Discussion in 'Electrics, Vacuum, Ignition and ECU' started by alt, Jul 16, 2015. Firstly, did this happen anyone before? Secondly, this will need to be repaired - is the connection mini-spades? It was dark when I noticed to decided to leave it until tomorrow to pull apart. When I did try to remove the connector, the brown wire wanted to stay put... so think i'm best leaving until it's cool to pull out with a plyers, but I suspect it'll break. 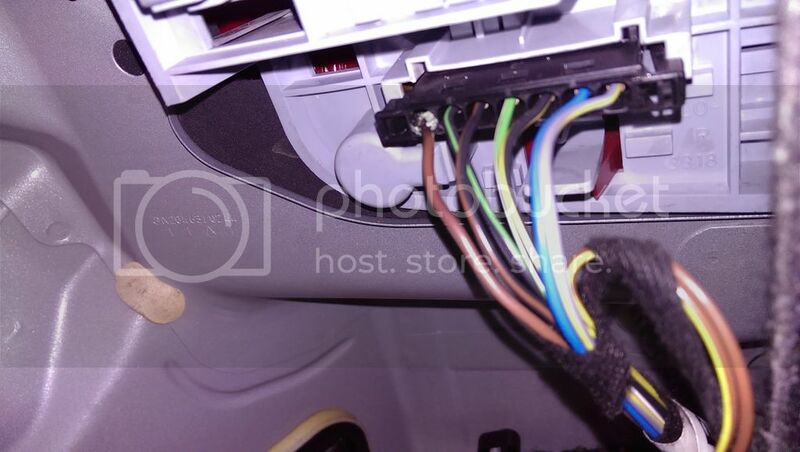 Finally, is this brown wire powering the driving lights (top and bottom??) not too familiar with the wiring tbh. The brown lead is the common ground wire, it is too thin and cannot carry the load. when the wire has been arcing, it can be hard to remove. The wire does not come out on its own, you release the whole plug, when the plug is out, you can push a pin in and release the little catch on the metal connector and you can fit a heavier gauge wire. This is a known fault that we have to pay for, shocking this will be about 6 car models in a row where MB have been penny pinching on the rear light wires. Turns out it's a common problem after Googling. I'm going to put a bigger earth cable in there. Can anyone advise me of the part no. for both the backing plate and the black plastic connector, as i'm sure both need replacing. Also, what is the connector I need to purchase to make off a new connection with a heavier cable? As in, the female connector that is crimped at the end of each of the cables. Sorry I made my above reply before seeing yours. Thanks for letting me know that the brown (earth) wire stays in even when the black connector is pulled out. I'm guessing that the backing plate is damaged, so wondering if I should replace it? You can add one to the existing or a complete new one. I did this fix today, soldered directly onto the metal earth 'board' and used a circular lug to connect to the frame of the car. No idea on the bulb, but pleased the mod went well. No prob, thanks - maybe someone else will know. I asked on a US MB forum and they say there's a recall for this. Is there? If so, i'd need to know the recall number as the Irish MB dealer (as with any dealer in Ireland) are usually less than helpful when it comes to this - I would have to show proof that there's a recall to get anywhere. That solves that one, so. Someone told me that it was the plug / holder that was the issue, rather than too light of a cable. Is this correct? I have not seen one, but one can tell by the condition of the brown wire, if it is had and deformed near the plug, then the contacts have lost their tension. You have done the right thing by soldering direct. The fault arises from driving at night, waiting with foot brake on and indicating. It is a shocking state of affairs and there has been problems going back to the 210 rear lamps and many models since. BTW, found the issue with the dim wedge light... it was old and had 'glazed' hence not much light getting through. Replaced it with another 5w and much better now, all looks normal... will check when it gets dark that all is back to normal. The fault arises from driving at night, waiting with foot brake on and indicating. Malcolm, thanks for explaining why my nearside brown wire is getting warm - I have dipped headlights on full time as my car does not have DRL's, plus I tend to leave the car in D with my foot on the brake at traffic lights etc!. I checked all the rear bulbs yesterday as I've had a "Right rear marker bulb" warning a few times on the dash - found 1 x P21W on the nearside looking sad, and 1 x LED (?5W 501) top light on the offside failed, so changed both and all appears well. Will they take less current than the P21W standard bulbs, and thus reduce the chance of the earth brown wire overheating? Just had this problem and saw this thread. The first symptom was a rear indicator bulb failure (rapid clicking) which then cleared. Intermittent but then got a warning of brake, light and indicator bulbs blown. Investigated the cluster and found the burnt brown wire. Terminal totally corroded and burnt on the plastic bulb board. Found a replacement board for £18.40 and a new plug and spade terminals for £14 on eBay and an easy replacement. My car is now 10 yrs old so hopefully will last for as long as I need it. Obviously a design flaw. Probably could have got by with a adding a bit more wire and a direct solder to the board but decided not to. Good idea. I guess I need to check the other side also.